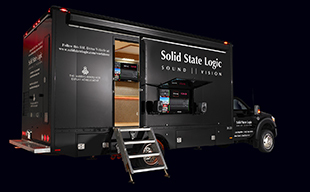 FRANKFURT, GERMANY — Solid State Logic, the world’s leading manufacturer of tools for creative audio professionals is proud to announce a trio of major new developments for their acclaimed Duende Native range of plug-ins at the 2014 ProLight & Sound Show (Hall 8. Stand L80). The superior audio quality and deep feature set of the SSL Duende Native plug-in range has earned the respect of a very discerning clientele through the years. The three new plug-ins complement the existing range with two plug-ins (X-Saturator & X-ValveComp) designed to bring some analogue saturation and distortion emulation to your digital DAW and the third (X-Phase) delivering high precision frequency specific phase correction. The new plug-ins are due for public release by May 1st 2014. To coincide with the new plug-in release SSL has announced migration of the entire Duende Native plug-in collection to the iLok copy protection system. SSL has also announced a summer release for AAX versions of the entire suite. X-Phase is an All-pass Filter plug-in that offers the user manual control and benchmark audio quality. It enables the user to apply a phase shift (sometimes called a phase offset) at a specified frequency within a signal. Unlike other filter types where the gain of selected frequencies is altered, with an All-pass Filter the gain remains unchanged throughout the signal. This is useful for fixing phase problems with microphones when recording: eg overheads causing phase problems when mixed with close mic’s. With X-Phase the controls are simple: a Frequency control selects the desired frequency where a phase offset needs to be applied, a Q control sets the slope of the curve of correction to be applied across the signal and a phase invert button enables the phase of the filter to be flipped 180 degrees. A separate Delay section is applied to the entire signal for broader time alignment. The Delay controls consist of a delay control which can be set to display and adjust in seconds, milliseconds, samples, metres or feet and a set of buttons for fine tuning. The overall plug-in can be used in mono or stereo modes. X-Phase can be automated via standard DAW Automation data and has A&B Preset ‘slots’ with an A/B switch for easy comparison of two different combinations of settings. There are Input and Output Meters with Input and Output Level controls. Read More. X-Saturator delivers a stunning range of analogue style distortion effects. It is an emulation of an analogue circuit that introduces either 2nd order valve style or 3rd order transistor style distortion or a blend of the two. At low drive settings the distortion is mild and can add gentle warming to help instruments sit nicely in a mix or to add a little extra edge to help instruments cut through a mix. As drive levels are increased so too is the level of distortion until at high drive levels heavy distortion occurs. The controls are simple: a Harmonics control selects 2nd or 3rd order distortion or a blend of the two, a Drive control sets the drive level, a Depth control adjusts the amplitude of the distortion and a Shape control adjusts whether the distortion has smooth or hard edges. A Headroom button provides an additional 6dB of headroom for creating heavily boosted/distorted signals without digital clipping. A dedicated wet/dry mix control facilitates parallel processing. There are Input and Output Meters and Input and Output Level controls. X-Saturator can be automated via standard DAW Automation data and has A&B Preset ‘slots’ with an A/B switch for easy comparison of two different combinations of settings. Read More. Special introductory pricing of £49, €59 and $85 + Tax for the first 30 days only. X-ValveComp is a fully-featured mono or stereo channel compressor with a full set of classic channel compressor controls and an added ‘valve’ emulation stage. The valve emulation stage sits after the compressor in the signal path and adds a variable degree of primarily 2nd order harmonic saturation and distortion that thickens and colours the sound. The compressor can be switched between Peak or RMS modes and has a full set of standard controls including; Threshold, Ratio, Knee, Attack, Release and Hold. There are Input and Output Meters with separate kick down compression amount indication and Input and Output Level controls. There’s a Gain Make Up control and switched Auto Gain Make Up mode. A dedicated wet/dry mix control facilitates parallel compression. A Side Chain input high and low pass filters can be used to trigger compression. X-ValveComp can be automated via standard DAW Automation data and has A&B Preset ‘slots’ with an A/B switch for easy comparison of two different combinations of settings. Read More. To coincide with the release of the new plug-ins the entire Duende plug-in collection will be migrated away from SSL’s existing ‘Codemeter’ by WIBU Systems based copy protection system to the more widely used iLok system. The move is aimed to streamline the purchase process and improve overall user experience. Existing Duende Native and Legacy DSP hardware owners (who have not already cross-graded to Duende Native) will be offered a free cross grade to iLok. Owners of Codemeter hardware dongles purchased directly from SSL (offer excludes Pro-convert dongle owners) will be offered a 50% discount on iLok purchase from SSL’s online store and a free X-Saturator or X-ValveComp plug-in. SSL’s Codemeter based online license centre will cease to function in January 2015 so all users are strongly encouraged to migrate to iLok by December 2014. SSL’s iLok support is scheduled to become live by 1st May 2014. Release of versions of the entire Duende Native plug-in suite which are compatible with Avid AAX Native format and thus ProTools 11 are due for release in Q3 2014. The AAX versions will be free to all existing iLok based Duende Native plug-in owners.